Rising from the ashes of Fenix, TX, Denver Harbor continues the tough task of bringing respect to the much-maligned pop-punk genre. On SCENIC, the quartet's solid riffs hold up better than anything New Found Glory has offered, while the sinewy lyrics go deeper than The Offspring and Blink 182 combined, heard on the punchy "Outta My Head". And when the boys decide to get a little melancholic on songs like "All I Want" and "Let You Go", they opt to tone the whine down a whole lot and sing from the heart, a trait all of the fashion punkers out there should take note on. 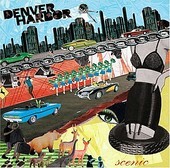 Sturdy songwriting with a bevy of hooks and memorable choruses is what Denver Harbor specializes in, and Scenic won't disappoint if you're looking for a band in between Foo Fighters and Green Day.